White Recron Fiber Pillow, Size: 16"x24" / 17"x27" / 20"x30"
Size: 16"x24" / 17"x27" / 20"x30"
Micro Fill Pillow with different sizes such as 20"x30", 17"x27" and 20"x34", 16"x16", 18"x18", etc. 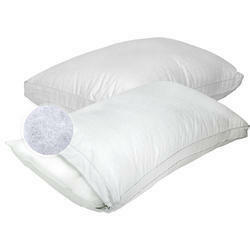 We make pillows of soft & medium in any sizes, made from the best fiber. super soft luxury pillow.. material used fresh reliance fiber pillow cover nd pillow bags per piece 500 grams .. 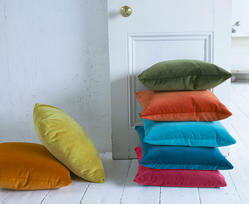 The polyester fibres are made into tiny “soft pallet size balls or clusters of fibre that blend together. The Ball Fibre is springy, fluffy, odorless, non-allergenic, lightweight and voluminous, so the resulting products are light and washable, and can maintain body temperature, providing the best quality and the utmost comfort for the consumer at a competitive price. This is a funky chic fiber filled ball cushion.The poly silk fabric is ruffled around in such a way , that it looks playful and soft.This cushion has a very modern feel to it.It can adorn your living room as well as bedroom in a very beautiful manner.This can be made in any colour of your choice .